Fraud and Big Business - Look what I made! On May 23, 2016, at approximately 1:00pm eastern time, my wife responded to a phone message indicating an issue with the IRS. The person who handled her call insisted that she was subject to arrest if she didn’t clear up a tax evasion issues from her 2014 tax return. He gave his name, badge number, dates that the IRS sent correspondence and threatened her with a public arrest and public humiliation if she didn’t follow directions to immediately clear up this balance. Yet this whole conversation was a fraud. When I finally tracked my wife down she had already acquired the cards and complied with every one of the person’s requests to stay out of jail. I immediately knew that this was a scam and we went back to the post office to retrieve the cards that the fake IRS employee told her to mail to a bogus address. We called the police and they arrived at the post office. They talked to the scammer online. There is a record with the local Police Department. We did retrieve the cards. When we tried to follow the steps for cancelling these cards, we found that there was no way to get through to the prepaid companies. All the phone numbers on the back of the cards were for automated computer responses and one of them even asked for our social security number…after just being scammed. When we questioned a representative from OneVanilla a prepaid company, he said that the payee who received the funds was a known fraudulent business. Further investigation found that this scam has been running for over 5 years. The IRS even has the very name of the individual that was being used. The use of the prepaid Visa card is part of the plan. The perpetrator knew this and directed every step of the transaction. He knew the location of the stores and knew where the cards were sold. He knew how to instill fear and he attempted to wipe every trace of the transaction away by insisting that we mail the cards…to a phony IRS address. This is known to pre-paid companies and no warning are made on the website, the cards, or at the point of sale. There is no way of accessing a human being and even as the crime was being committed we couldn’t stop it because we can’t get in touch with a human. All totaled, 10 Visa cards totaling just under $5,000.00 were purchased and used to pay our phony delinquent tax bill to the scammer. Of those 10, 6 were Green Dot cards and 4 were Vanilla. Based on the information obtained so far, it is clear that Green Dot and One Vanilla were aware of this situation. Additionally, Green Dot’s consumer access to their customer service is deplorable in light of this threat. Since there were no warnings about this scam that regularly utilizes Green Dot cards among others to launder their money, there is clearly a perceived liability on the part of the issuing bank. I say perceived because it is my viewpoint and my perception matters here. Since this happened almost 2 years ago and we had reported it to Green Dot and Vanilla and neither company has seen fit to respond to our case, we are pursuing a lawsuit. 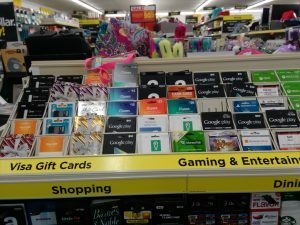 These cards are sold in drug stores and dollar stores and they are displayed like candy and activated by clerks who know little more than the fact that they must be purchased in cash. Since that time there has been a major break in one of the organizations responsible in India and there has been no restitution paid to the victims. Still there is no warning to the consumer that they are being scammed if being called by the IRS and directed to these financial instruments because, apparently, it would cost the companies money. According to Green Dot’s corporate site, they are doing quite well in returning corporate profits for those investors who don’t care for the dark side of their business or even dealing with consumers who are victimized by crooks who know their practices and know that they will continue to look the other way when presented with these crimes; yet they are as guilty as the person supplying a getaway car in a bank robbery. Financial fraud perpetrated on citizens through use of phone, mail and financial instruments is far more devious and dangerous and under reported. It is for this reason that I have engaged an attorney to sue the companies that have participated in a fraud and done nothing to prevent it from happening again. The criminals are still out there as my family members continue to get these calls. I am suing because they are at the very least negligent if not complicit in the crimes being committed against Americans. Clearly they have been silent on this issue because the percentage of frauds using their products represent a significant enough portion of their profits to make it part of their business plan. Sad.